The passage of time can sometimes be quite deceiving, especially when you find yourself busy with school, work, or just life in general. It only feels like yesterday that I had assembled my current (now former) personal computer, but upon perusing the dates I realised that it has been 16 months since I had freshened up the system; whilst the system itself had been assembled back in 2016. Oh my, how time flies when you are busy. My plan involved purchasing brand new components and not reusing a single part from my previous build. This initially sounds like a great idea, but as I am currently on the very limited income of a student, this would mean having to purchase components one at a time. As you will soon find out, this resulted in a fair amount of time between purchases and several components sitting idly gathering dust. It was only a couple of weeks ago that I decided enough was enough, and wanted to start making use of what I had purchased so far. The build is far from complete and has a few temporary compromises for now, but this is how Arctic Flow has started to take form. One of the first decisions I had to make was choosing a chassis, enclosure, case, or whichever term you prefer to use for the ‘box’ that holds all of your components. I started conceptualising my build back in 2017, but it was not until 2018 that I started to make some concrete decisions in regards to what type of case I wanted. With some superb offerings from manufacturers such as Lian Li, InWin, Cougar, Cooler Master and others, I certainly had plenty of styles to choose from. Since I wanted to water cool the system, having the space for the components required was also a primary concern; but I also wanted to implement features such as a distribution plate rather than a conventional reservoir. 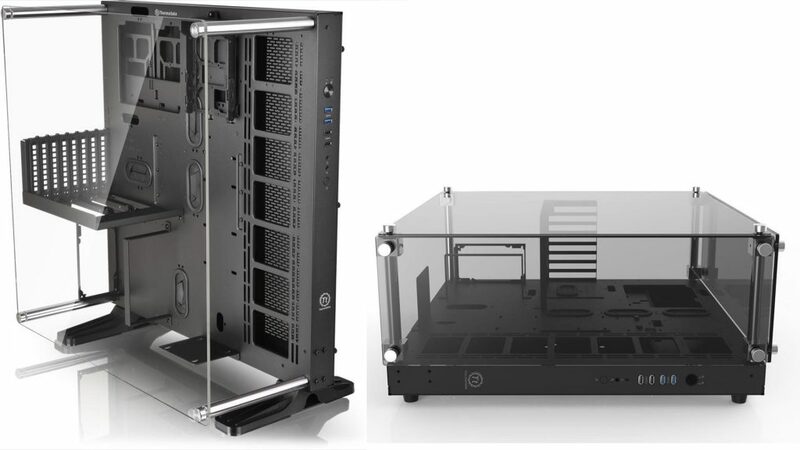 Ultimately I decided to purchase the Core P5 from Thermaltake that is pictured above. This particular case is considerably modular and also provides the flexibility of being able to sit vertically, horizontally, or even be mounted to the wall. There are several variations of the case available, different colours as well as models with tempered glass; but I opted to go for the traditional black with a simple acrylic window for now. Perhaps later down the line I will upgrade to the full glass (pictured on the right), which can be purchased separately. Since I also have limited space available (my office/gaming area is an under-stairs cupboard! ), the profile of the Core P5 felt like the perfect fit. The next piece of the puzzle was to decide which platform would serve as the foundation of my build: AMD or Intel? There is no denying that for gaming, a top of the line Intel processor will provide the best performance; but since I was also concerned with multi-threaded applications and also on a limited budget, the draw of an AMD-based system was just too strong to resist. When you factor in that AMD plans to continue supporting the AM4 socket for quite some time, I could potentially have a platform with an upgrade path in the future without having to purchase another motherboard; instead just requiring a BIOS update and then being able to slap a new CPU in. 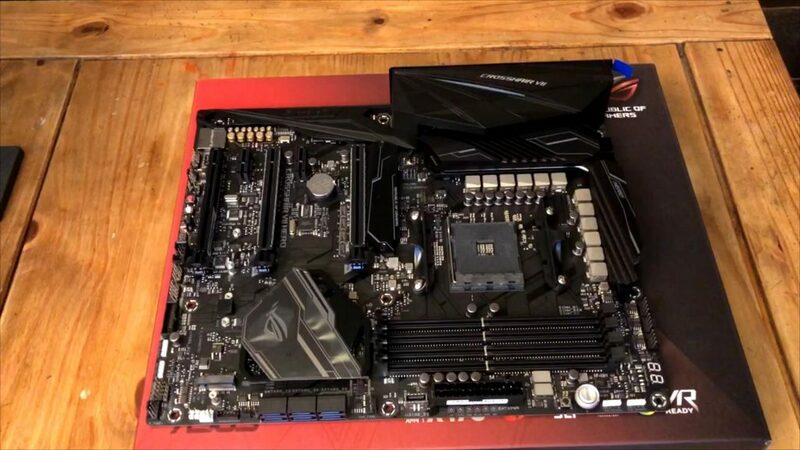 As a fan of Asus products, I immediately knew that I would be purchasing one of their motherboards. Their build quality is generally stellar, and their top-of-the-line offerings are usually packed with features. As I was planning on water cooling the system and likely trying to overclock the CPU eventually as well, the ROG Crosshair VII Hero was the obvious choice; utilising the AMD X470 chipset and support for Nvidia SLI and AMD CrossfireX (not that I would necessarily incorporate either), this particular board also features excellent power delivery and regulation thanks to its VRMs (which are considered some of the best on the market). Plus it has RGB, so it has to be good right? In the past I have always used power supplies from Corsair and Cooler Master, but I really liked the look of the Project 7 PSU from Aerocool. With a platinum rating and delivering up to 850 watts, this seemed like the perfect choice for my build. More details of the PSU can be found here, and reviews online are all considerably positive in regards to performance. Once again, this product features RGB capabilities; which I know not everyone is particularly fond of. Keep in mind that just because a component features RGB, it does not necessarily mean that you have to configure them as a psychedelic light show. 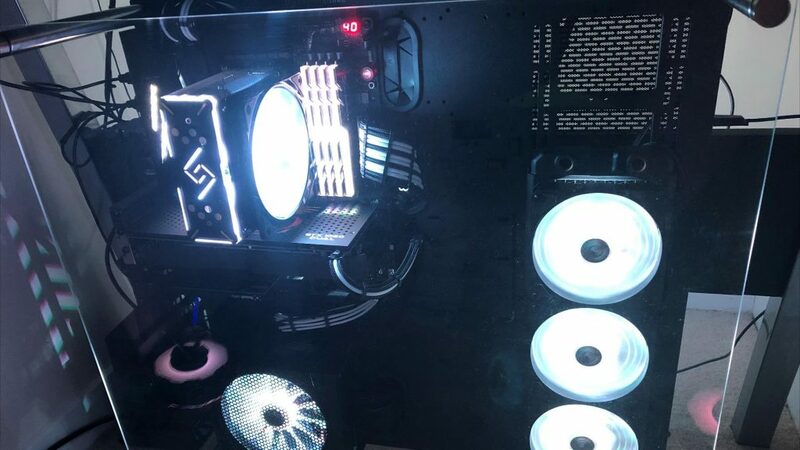 The flexibility of RGB components does however provide you with the ability to choose exactly what colour you wish each component to glow as, and ambient lighting within a water cooled system looks absolutely stunning. As you may have guessed, just about every future purchase will feature RGB capabilities where possible. This is another benefit of using products that are Asus Aura Sync compatible, as I can manage the lighting all via the motherboard software. One of the first larger purchases that I knew I would need to make was of course some shiny new DDR4 memory. As I wanted to have 32GB of RAM, a 4 x 8GB kit seemed to be the most applicable choice. 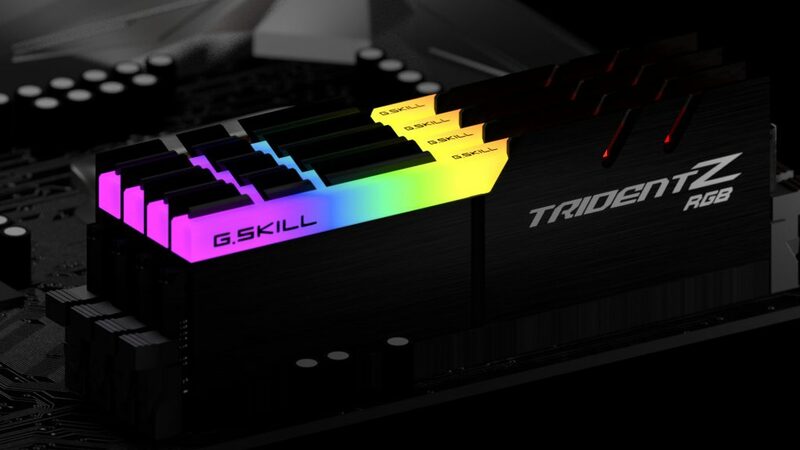 G.SKILL is a brand I have used and trusted for several years, so picking up a kit of their Trident Z RGB (3200MHz) was a no-brainer. Whilst technically not compatible with the AMD Ryzen platform (2nd Gen Ryzen CPUs only officially support up to 2933MHz, and even less when all 4 slots are populated), I was aware that with some tweaking of settings they would work just fine. Plus with any luck, future BIOS updates and of course subsequent generations of Ryzen CPUs may officially support these higher speeds. I will discuss the importance of RAM speeds and timings in more detail during a future episode of PC Building Fundamentals, but for now we will just leave that particular can of worms closed. When I first added the kit to my wish list, the price was fairly steep at the time; so I knew it would be a while before I would be able to snag them. But fortunately in October, their price dropped by around 25%. Needless to say I capitalised on the discount, as the prices had been fluctuating for quite some time. The system was heading in the right direction, but with so many more parts to purchase, this was merely the beginning. My original vision for this build involved using an AMD Ryzen 2700X (an 8 core, 16 thread CPU) and an AMD Radeon RX Vega 64 graphics card. The CPU was an obvious choice, it would provide exceptional multi-threaded performance for things such as video editing and rendering, whilst also still providing a high level of single-threaded performance for gaming. For a considerably lower price than the offerings from Intel as well. The Vega 64 might seem like a stranger choice though, especially considering that you can purchase Nvidia cards for less that will undoubtedly outperform the offering from AMD. But there was one other factor I had in mind, and that of course was Freesync vs G-Sync (which are sub-types of the umbrella term known as Adaptive Sync or Variable Refresh Rate). The concept of Adaptive Sync is worthy of a full article dedicated to that one subject, but in a nutshell it allows for games to stay silky smooth even when the fps drops below the native refresh rate of the monitor. If you are running a 60Hz panel, and have hardware that is capable of pushing 100+ fps, then this type of technology is usually unnecessary; just enable Vertical Sync and forget about it. If however you have a high-resolution display which also features a high refresh rate (100/144/200/244Hz), then your hardware would need to be running at or in excess of that number. With that in mind, I knew I wanted to eventually purchase a greater than 60Hz panel in the 21:9 form factor. Ideally with a resolution of 3440 x 1440, and a refresh rate of 100 – 144Hz. G-Sync monitors are considerably more expensive than Freesync monitors, so it made more sense to go with the AMD option. It would still give me silky smooth performance, and I would save a little bit of money. Also, bit of an unpopular opinion, but picture quality on AMD graphic cards is (in my opinion) noticeably higher than Nvidia cards. Nvidia made a surprise announcement, that they would effectively be enabling Freesync through new drivers for their graphics cards. 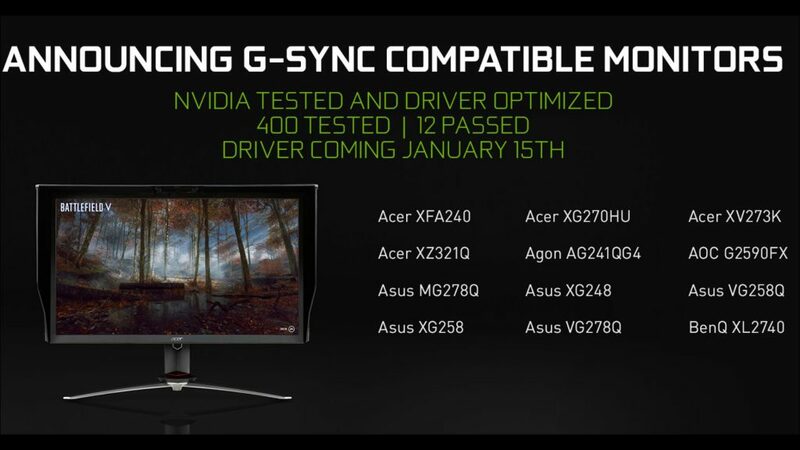 Whilst they framed the announcement as some Freesync monitors could potentially be G-Sync compatible, they basically just flipped a metaphorical switch within software to enable 10-series and newer cards to work with Freesync monitors; albeit not guaranteed to work with all of them. This was a significant game changer for me, as it meant I could potentially have a bit more flexibility or rather more choices as to which graphics card I could use for this build. But then AMD had to further complicate matters. AMD announced their next generation 7nm graphics card called the Radeon VII. Allegedly on par with an Nvidia RTX 2080 (and projected to cost the same I may add), this gave me even more to think about. Should I try to scrounge enough pennies to grab one of these, or would their release possibly allow me to snag a deal on a Vega card? Factoring in also that I planned on installing a waterblock for whichever card I purchase, I would be somewhat limited by that constraint. I still have not fully decided which option I will go with, instead I plan on waiting things out for now and monitoring the prices. But I know for sure that I will be purchasing a Freesync monitor, and I would prefer to use an AMD card to guarantee compatibility. AMD also unveiled the 3rd Generation of Ryzen CPUs, with the upcoming Ryzen 9 3850X offering 16 cores/32 threads with a boost clock of 5.1GHz for around $499! Or perhaps the more affordable Ryzen 7 3700X for $329, which is a 12 core/24 thread CPU that also boosts to around 5GHz. It was clear I was going to wait things out and grab one of these newer CPUs; which would no doubt be worth the wait, but would further delay a build which had been progressing very slowly already. Eventually I got tired of having new hardware just sitting around gathering dust, as I had also purchased a shiny new keyboard and mouse during the Black Friday sales (and a few other items); but refused to use them with my ‘old system’ so I decided upon an interim solution. With the GPU and CPU somewhat ‘up in the air’, I initially planned on just purchasing the water cooling items that I knew for certain that I would be using. Unfortunately some of the items were out of stock and when I thought about it a bit more, I would just be purchasing more stuff that would effectively just gather dust until I could use them. If only there were a way to actually start using some of this hardware. So I made the decision to purchase a relatively inexpensive CPU for now (a Ryzen 5 2600, which is a decent little 6 core/12 thread item) and just utilise my current SSD, Hard Drive, and graphics card. Then at least I would be able to somewhat set things up, potentially sell some of the older hardware to help fund the new build (turns out the i7-4790K is still a very desirable item with enthusiasts). Then later down the line I can swap things out and upgrade as necessary, with the final step being constructing the custom loop. I also figured it would be a great time to purchase a new desk. Whilst there was nothing technically wrong with my old one, the interior of my ‘closet’ is 100cm wall-to-wall; so I wanted to find a desk that would fit perfectly rather than leave gaps on either end. There are plenty of fabulous desks in sizes of 110/120cm and more, but finding the exact size I needed was significantly problematic. Until I came across this little number, which fits absolutely perfectly. With all of that decided, I dismantled my office area and removed the parts from my old system that I would use for now in my new build. Gaming performance would be about the same for now, but at least the increased core count and faster DDR4 memory (the old system uses DDR3) would be noticeable for applications such as Vegas/etc. I know, that was a lot of flashing colours, I deliberately did that just to display the capabilities of having everything synced up. The only exception at the moment is the separate strip I have behind my desk, which will be replaced later with one that can be synced up. Whilst all the colours of the rainbow can be fun, for most of the time I just have the system as close to white as it can be. Excuse the lack of cable management behind the desk, I did not see much point since things are not finished. Once all of the components have been purchased and a new monitor placed, then I will try to go for that clean and invisible look. It also might seem strange having a 360mm radiator just sitting there doing nothing, but I wanted to get the fan cables (power and RGB) routed; plus it keeps the radiator in a safe place rather than risk it getting damaged laying in a closet somewhere. The case itself also looks a bit empty at the moment, but once the distribution plate (which will basically fill that entire inverted L area between the motherboard and radiator) is mounted and the graphics card switched over to a vertical installation, things will appear a bit more full. 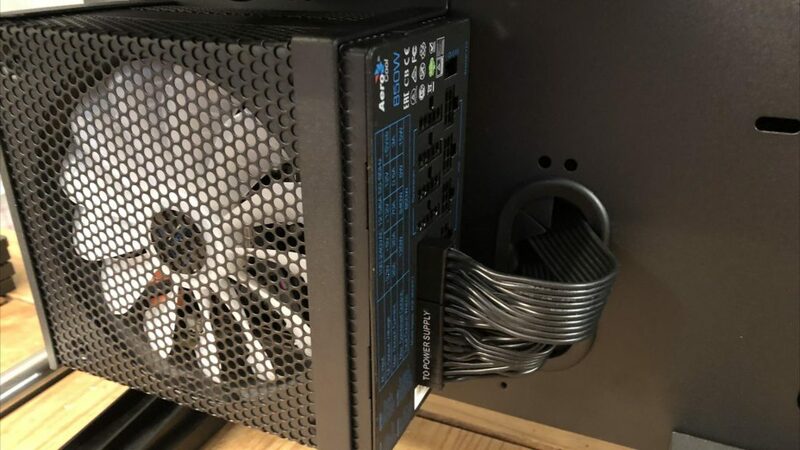 The system in its current form also does not draw enough power for the 850 watt PSU to bat an eyelid, so is operating in full-silent mode; hence why the fan is lit up but not currently spinning. Once a beefier CPU and GPU are installed, there will be a significant increase in power draw. I have a long way to go yet, and still a considerable amount of money to spend on this system. It may be slightly difficult to conceptualise what the final product will look like, but I am certain it will be quite an eye-catcher once the custom loop is up and running and the colour scheme will become more apparent. I also could not decide on a name for the system, as I feel a project such as this requires an actual name. 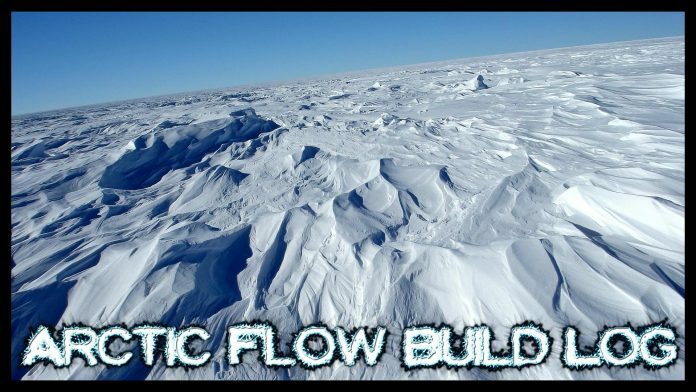 I do not have much of a flair for creativity, so after throwing around several ideas I decided to go with Arctic Flow for now. If anyone has any better ideas, well you know where to find me. 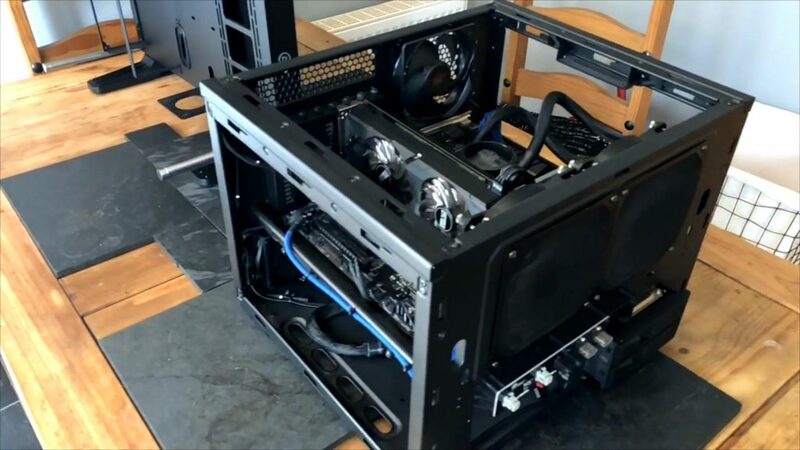 In the meantime I will continue with the PC Building Fundamentals series, where we can look at some of the components in a little more detail; and any subsequent build logs will no doubt be much shorter than this initial one. AcuteJungle66 has been dabbling with tech ever since he tried improving the tape deck of his Commodore 64 back in the '80s. Tech and Gaming have both been interests of his for several decades, but he also enjoys the great outdoors as often as he can. As a proud Military Veteran who spent much of his life on 3 different continents, he is quite content being back home in Scotland; where he enjoys a much 'quieter' life these days.